Veterinarian Dr. Bobbi Jo Massic with a rabbit patient. Dr. Massic treats exotic pets and pocket pets of all types and sizes at the Animal Clinic of Billings. At the Animal Clinic of Billings, we not only provide superior and compassionate care to your dogs and cats, but we also offer a full range of medical services for your smaller friends, such as birds, rabbits, reptiles, hamsters, guinea pigs, chinchillas and other small mammals. THINKING OF GETTING A NEW POCKET PET? It is no surprise that the human population in the United States has expanded over the most recent decades, and, in turn, so has the pet population, especially that of the smaller sized pets. Millennials are now the primary pet-owning demographic and account for half of the owners of small mammals, or pocket pets; which commonly include rabbits, guinea pigs, hamsters, ferrets, and gerbils. If you are ready to bring a new small pet into your home, it is important to do your homework to decide which pet is best suited for your family and your lifestyle. Small pets require special housing equipment to keep them safe from the dangers they may encounter if they should escape into your home. Many pocket pets suffer from chronic health conditions, usually because of inadequate nutrition and husbandry. Most of these types of pets require more specialized care due to their exotic origination. Many of these health conditions can be prevented with the proper education and guidance, which our veterinarians at the Animal Clinic of Billings can provide. Part of being conscientious about the pet overpopulation problem is to spay or neuter your pet rabbits. Rabbits reproduce faster than dogs or cats and often end up in shelters, where they must be euthanized. Neutering male rabbits can reduce hormone-driven behavior such as lunging, mounting, spraying, and boxing. Just like cats and dogs, your pocket pet or exotic pet deserves regular veterinary care in order to maintain good health. If you have recently acquired a rabbit, guinea pig, hamster, bird, turtle, lizard, hedgehog or other pocket pet, it is recommended you bring your new little family member in to see your veterinarian within the first two weeks of adoption. This visit will allow your veterinarian to check your pet’s current health status and answer any questions you have regarding your pet’s future care. You and one of our versatile veterinarians at the Animal Clinic of Billings will work together to develop a proper health care plan for your new little friend and companion. 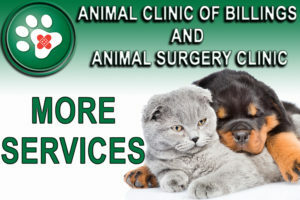 If you already have, or are thinking about getting a new pocket pet or exotic pet of your own, look no further than the Animal Clinic of Billings for all your veterinary needs. Call us during our convenient office hours to schedule a health checkup for your furry, feathered, hard-shelled, prickly or scale covered companions today!